The Observatory is located 20 miles southwest of downtown Wichita at MacArthur Road (39th Street South) and 247th Street West in Lake Afton County Park. It is immediately north of the lake, just off MacArthur Road. 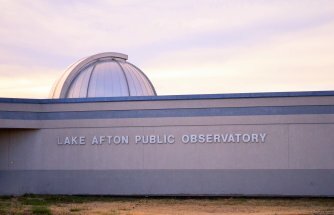 Our mission at the Lake Afton Public Observatory is to promote appreciation and education of astronomy by making it more accessible to the public. Through the Observatory's 16-inch telescope you can view Saturn and its rings, the Moon with its craters and mountains, glowing clouds of gas, star clusters with thousands of stars, and distant galaxies. After touring the universe, you can explore our museum area with its interactive astronomy exhibits. When visiting Wichita, make sure you put this unique attraction on your list of things to do. The Lake Afton Public Observatory is open to the public on Friday and Saturday evenings throughout the year. Our hours change as the sunset time changes, so check out our website for our current hours. 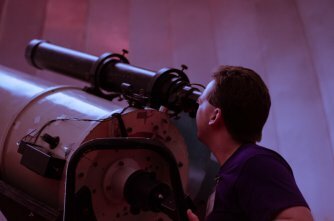 School classes, clubs, and scout troops can schedule a private event at the Observatory on Tuesday and Thursday evenings. We can also bring the learning to you. Our volunteers will bring their telescopes to your school, local library, or nearby park. Call (316) 448-6909 for details.